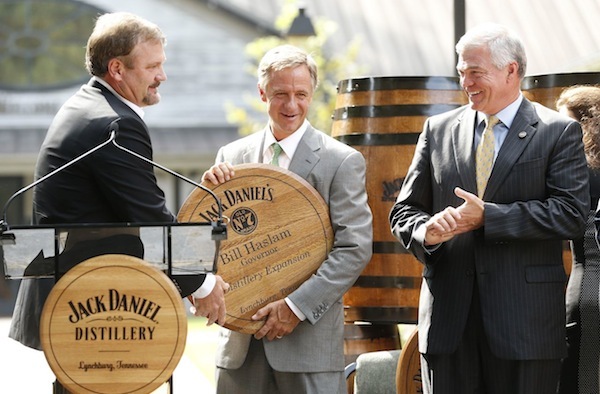 Brown-Forman Corporation tells BourbonBlog.com they are investing $100 million in an expansion of the Jack Daniel Distillery in Lynchburg in response to global demand for its signature Tennessee whiskey. Expansion work begins this fall and should be completed within two years adding more than 90 full-time jobs to the distillery over the next five years. Company officials didn’t specify how many stills and warehouses where the whiskey agers will be added. The distillery is bumping up against capacity pressures that will be relieved by the second production facility. 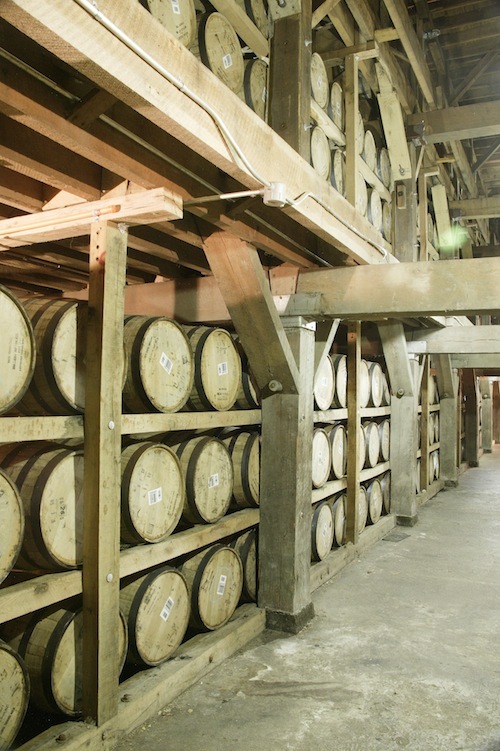 At BourbonBlog.com, we’ve been following the story of many distillery expansions. During the past two years, Bourbon distilleries in Kentucky have invested nearly $300 million in new and expanded production facilities, warehouses, visitors’ centers, bottling lines and more. 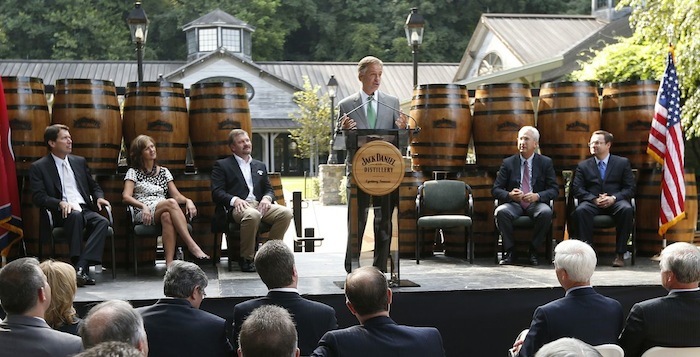 Today’s announcement came from top officers of Jack Daniel’s and several politicians gathered in front of the Jack Daniel’s Visitor’s Center speaking to journalists and the community. 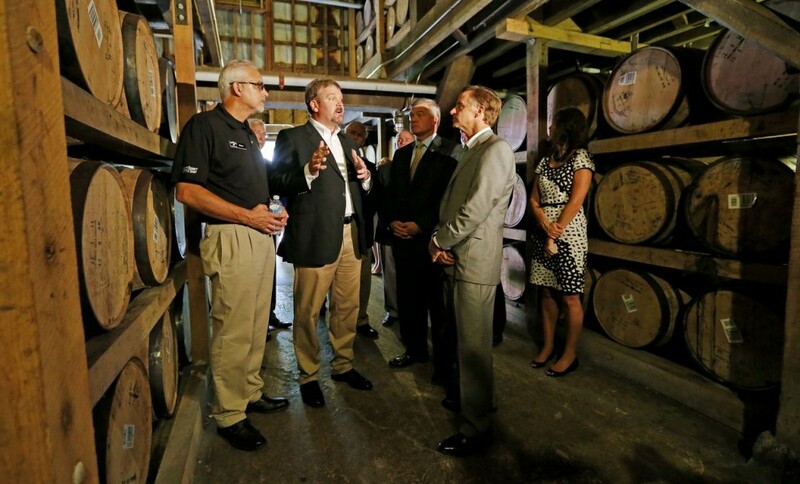 Included were Jeff Arnett, Master Distiller of Jack Daniel’s, Bill Haslam, Governor of Tennessee, TN Commissioner of Economic and Community Development Bill Hagerty, Jack Daniels Senior Vice President Jane Morreau, Senior Vice President of Jack Daniels Larry Combs, Senior Vice President and Managing Director of Jack Daniel’s John Hayes. Other notable political guests were present including Sloan Stewart, Mayor of Lynchburg TN. This past year, the Tennessee General Assembly passed legislation designating that any whiskey labeled as “Tennessee Whiskey” must be charcoal mellowed and produced in the state, in effect creating a new spirit category similar to Bourbon. “The demand for Jack Daniel’s Tennessee Whiskey worldwide speaks volumes for the craftsmanship and specialness of a spirit distilled from a small cave spring hollow in Tennessee,” said Jack Daniel’s Master Distiller Jeff Arnett. “This company is an American brand but, more importantly, a Tennessee brand well recognized across the world, making it a global ambassador for our home state,” Tennessee Gov. Bill Haslam said. 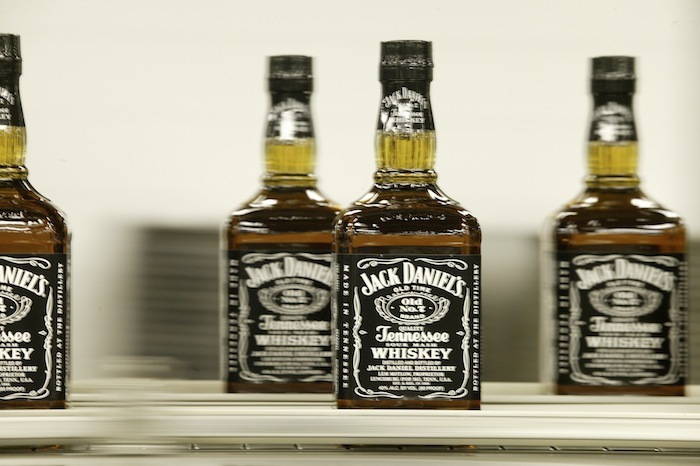 Jack Daniel’s sales have grown the past 10 years as the brand continues to spread globally. Jack Daniel’s has had volume growth for 21 straight years, and its global net sales increased by 9 percent in the last year. Since 2004, global case sales have risen from about 7.7 million cases to nearly 11 million cases last year. Overseas markets now represent slightly more than half of overall sales. Its largest international markets include the United Kingdom, Germany and Australia, where the brand’s premixed cocktails are popular. Emerging markets such as Russia, China, Turkey and Brazil have become key contributors to global sales. At the company’s annual shareholders’ meeting last month, Brown-Forman CEO Paul Varga apoke about the company’s efforts to grow market share for Jack Daniel’s, which is the best-selling American whiskey brand worldwide. Despite the strong sales for the brand, Varga said it only has about 3 percent market share in the whiskey market. He said segment leaders in other liquor types – such as tequila, rum and vodka – have a market share that tops 10 percent.